This newly designed 173d Airborne Brigade Casper Platoon vinyl decal/sticker is 4" round looks great on your auto. Limited supply on hand,, only 1 per customer. This new embroidered 4-Inch Casper Platoon Patch looks great sewn on a leather flight jacket or in a display case with your medals. Limited supply on hand, only 1 per customer. The Joe Kline Aviation Artwork has been a long-time favorite raffle prize won at our past reunions. We will have a drawing to win three customized prints. One at our Ice Breaker Party along with two others at our banquet dinner. Each Gift Certificate is valued at $125 and is good for a customized print of your choice. Please visit Joe’s web site & view his Vietnam Series Custom Artwork. The helicopters used at the top of this reunion web page were painted by Joe Kline and used in his: Good Vibrations and Eye of the Tiger artwork. GILDAN 6.5-oz. 100% pre-shrunk double pique cotton, forest green polo shirt with embroidery of newest Casper Platoon Logo on front. Available in all sizes S-XXL. Only available at reunion. No mail orders. Beautifully engraved is this Casper Platoon Flasks made especially for this reunion. Limited to supply on hand, and only available at the reunion. Only 1 per customer. Enjoy dining in the Tropicana at the Oakville Steakhouse, one of the resort's 6 restaurants, or stay in and take advantage of the 24-hour room service. Only: $75 / per night! Our 3-day Reunion Dates are: April 23, 24, & 25. Check out: April 26. However, our special Casper Platoon Room Rate can also be used to check-in early on April 22. In fact, our rate can also be applied for the 2 days before and after the reunion. Remember, The Tropicana is a Resort. Have fun and relax! The Tropicana has two Towers: The Paradise Tower is near the front entrance of the hotel closes to the casino. Our reunion is being held in the CLUB TOWER. This is located by the north entrance of the hotel next to the swimming pools, health spa and conference center. This is where our hospitality suite, guest rooms, the ice breaker party and banquet will all be at. Our $75/per night guest room rate is for the “Club Deluxe” Guest Rooms. The absolute BEST way to make your reservation is by using our “Online Reservation Link”… It Is Fast & Easy! Again you should book the minimum 3 reunion nights: Tuesday April 23-24 & 25, checkout on the 26. Several of the Caspers have already made their reservations to arrive a day early on: Monday, April 22. ►► When you make your hotel reservation, you will be charged for your first night = $75 + tax. However, there is a 48 hour cancellation policy. Receive a warm welcome with a freshly baked chocolate chip cookie before settling into a stylish, residential-style guest room with a breezy beach atmosphere. Decorated in a sunset palette of warm shades, your room features custom-designed furnishings, a 42-inch HDTV and Serta Perfect Sleeper beds™ with 300 thread count linens. Casper Platoon guests who drive will receive ”FREE Self-Parking” at the Tropicana Hotel. A variety of shuttle/limousine services are available at McCarran International Airport (LAS). 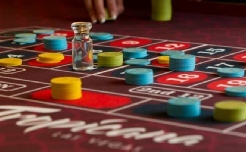 There are also Taxi's and UBER rides everywhere, along with the Las Vegas Monorail. Street Address: 3801 Las Vegas Boulevard South, Las Vegas Strip, Las Vegas, NV 89109, USA. Our 2019 reunion fees are based on a flat rate to make payments easier. The Casper Member and Guest fee includes a name badge, access to our Hospitality Room, our Poolside Ice Breaker Party, Banquet Reception and one (1) Banquet dinner ticket (Steak, Chicken or Fish entree). Other: $65/each. Includes Spouse, Family, Guests or KIA & DAT Families. Payment Deadline: Full payment is due on or before March 1, 2019. However, a $50 minimum payment is due now. Fees are non-refundable. Men’s Lunch & Group Photo: $20/person (BBQ Buffet). Ladies Luncheon: $25/person (Sit down choice of 4 Italian entrees). Taking advantage of the cooler weather in April, this event will be held outside at the Sky Beach Club where we can enjoy a good time poolside with friends while relaxing by a nearby tropical waterfall. A time at our reunion to honor our fellow Caspers who are no longer with us. Also a great time to have cocktails & dinner with our Casper family and enjoy our company together. Just like at our 2018 reunion in Fort Worth, we will once again have our own Hospitality Suite that is located on the ground floor of the Convention area. This Landing Zone is called the Partagas 3 Room. I imagine it will also be a popular place to set down and hangout. Our LZ will be open on Tuesday at 12 noon thru Thursday at 3:00 pm and configured with round tables & chairs. Stop by, pull up a chair and relax! At The Leatherneck Club. This is the only Military theme restaurant and bar in all of Las Vegas. This is a great place for us to hangout, eat, drink and take a group photo while enjoying a BBQ buffet. 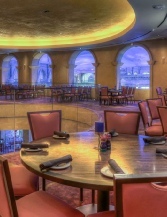 TREVI is located in the Forum Shops at Caesars and is Las Vegas’ favorite restaurant for Italian fare. Named "Best Italian" by the Las Vegas Review-Journal. Our private dining room, choice of 4 entrees. 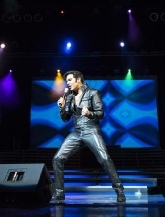 Top tribute artists bringing to life the performances of an incomparable cast of music legends like Elvis Presley, Frank Sinatra & many more. Please list your name(s). Make your $20 check payable to CAPO and mail it to Ned Costa . Please list your name(s). Make your $25 check payable to Marilyn Jones and mail it to Marilyn Jones. If you are like most of us, your best friends are probably the guys you served with in Vietnam. Our reunions create a great place to hang out with them at least one-time a year. You have probably also heard over the years that “we aren’t getting any younger”. This statement is very true. 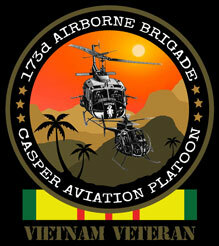 Our annual Casper Aviation Platoon Reunions are also open to Vietnam Veterans who were affiliated with the 173d Airborne Brigade, LRRP, N/75 RANGERS, 335th AHC and 61th AHC veterans who would like to attend. So why should you attend… To enjoy a few days with your best friends! A “Special Drawing” for a $100 Bill will be raffled Tuesday Night at 6:30p during our poolside “Ice Breaker Party.” A special ticket with your name printed on it will be in the raffle drum for this Free Drawing! You just need to be there to win. A Custom Engraved Bottle of Stranahan’s Diamond Peak Whiskey with special leather case, $150 value. (6) Hand-Carved Mahogany UH-1 Huey Models, $125 value/each. (3) Joe Kline Aviation Art Gift Certificates, $125 value/each. 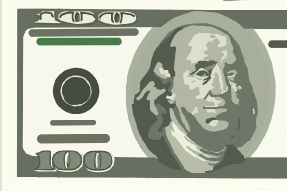 (4) $50 Bills. Prizes will be won at the Ice Breaker Party and/or our Banquet Dinner. Richard D. Chegar, Major General, United States Army (Retired) served in the 173d Airborne Brigade (Separate) from its beginning on Okinawa in 1963 and in the 1st Battalion (Airborne), 503rd Infantry in Vietnam during 1965-66, including Operation Hump. 1LT Chegar served as a the Aide to General Ellis Williamson, Platoon Leader, then the Company Commander of A/1/503d Infantry. We are honored to have General Chegar as our Key-Note Speaker at our Casper Platoon 2019 Reunion. He will address our group at the banquet dinner and discuss how important all of the aviation support was to the 173d Airborne Brigade that was provided by the Casper Platoon and the other aviation assets from Company A/82d “Cowboys” Aviation Battalion during Operation Hump…You won’t want to miss this!